Only 10-minutes! 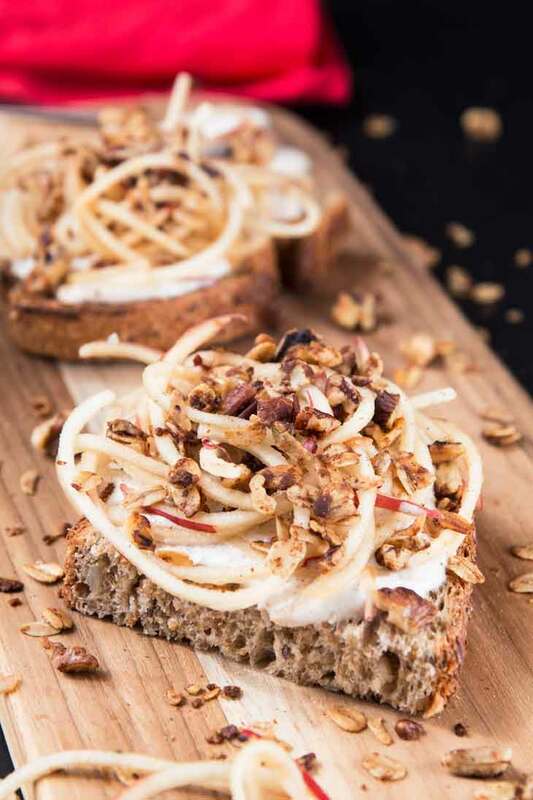 That’s all it takes to make this easy Vanilla Yogurt Cinnamon Toast recipe topped with spiralized apples & home-made skillet granola! It’s quick and simple, vegan, can be made gluten-free, and the best way to indulge in the mornings. Not to mention leftovers make for the best dessert! This post was sponsored by Silk, but the opinions and text are fully my own. Who loves a bowl of smooth and creamy yogurt? And what about those unlimited yogurt toppings that make for the perfect parfait? Or are you a morning breakfast toast person? Are you someone that needs something fast and homemade, but crave that indulgent breakfast that typically takes way too much time to make on a weekday? Well put down your bowl of yogurt or parfait, stop eating your standard bowl of cereal or granola, and forget about your typical spreads for toast. This new vegan breakfast recipe is a combination of all things you love and is soon to become a new favorite! And the best part about it is that you can make it in just 10-minutes! It’s YOGURT TOAST! And I’m not just talking about slathering a spoonful of any random yogurt on some plain piece of bread and calling it breakfast. 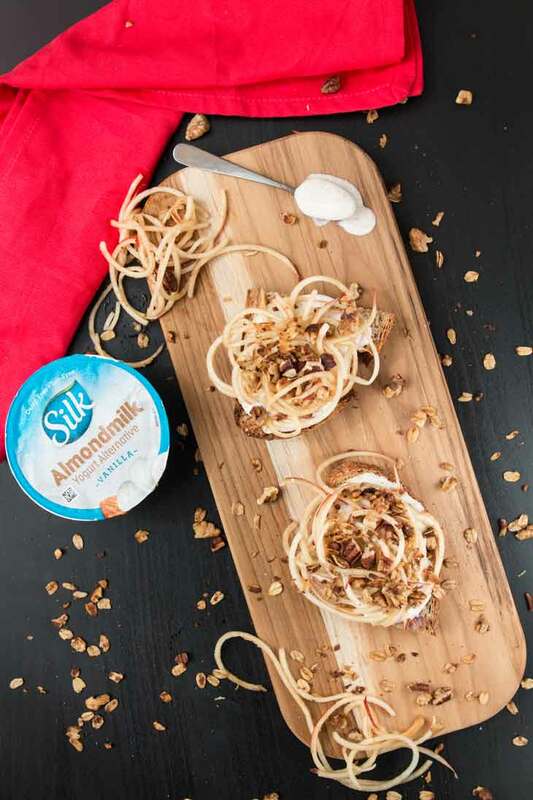 I’m talking about using SILKs dairy-free Almondmilk Yogurt Alternative! We’ve been a SILK family for years…we have at least 4 of their plant based milk alternatives in our fridge at any given time. So when SILK came out with their new non-dairy almondmilk yogurt alternative, I had to give it a try. From their five delicious flavors (vanilla, dark chocolate coconut, strawberry, peach, plain) that come in single-serving cups, to their two (plain & vanilla) larger 24-oz almondmilk yogurt tubs…they’re all vegan, gluten free, carrageenan free, soy free, and contain 5-6g protein straight from almonds. 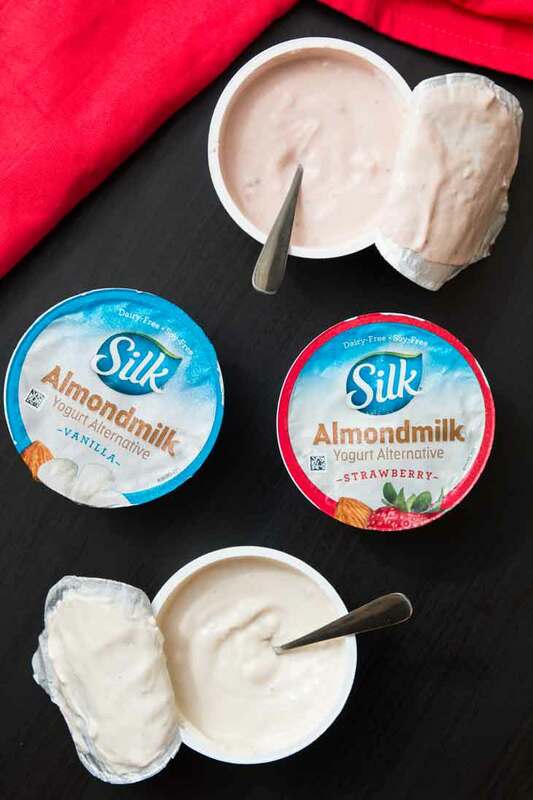 These new dairy-free almond yogurt alternatives are so smooth, creamy, and perfect for a variety of different recipes or to simply enjoy with a spoon! 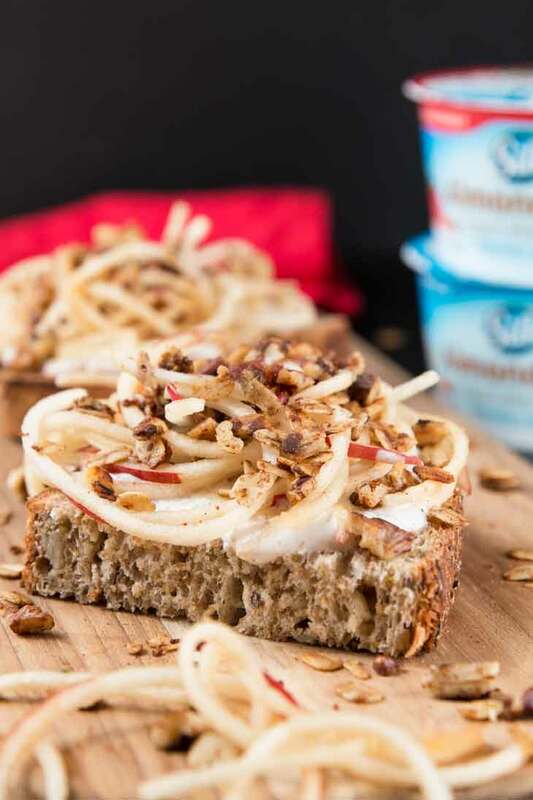 So I thought why not create an easy indulgent vegan breakfast recipe where you can really just take a spoonful of SILK almondmilk yogurt and slather it on your favorite toasted bread! I took it up a notch by combining that cool and creamy vanilla flavor with cinnamon, and topping it with spiralized apples and a simple 5-minute skillet granola made with oats, walnuts, pecans, coconut oil, cinnamon, and coconut sugar. Although it sounds and looks fancy, this yogurt cinnamon toast recipe is super easy and takes only 10-minutes to make, start to finish! Toast your favorite slice of bread. Make a 5-minute oat-nut granola blend on the skillet. Mix cinnamon into SILK smooth & creamy vanilla Almondmilk Yogurt. Spiralize or thinly slice some apples. This recipe is easily customizable to fit your preference or dietary needs. The combination of vanilla, cinnamon, apples, and nuts is one of my absolute favorites. But if you’re not like me, you can just as easily swap out any other flavor of SILK dairy-free almond milk yogurt, or even use plain if you prefer unsweetened. 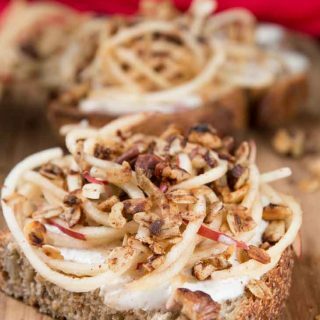 Sub out apples for any other favorite fruit combo, omit the nuts or sub in seeds for a nut-free option, or use your favorite gluten-free bread. See the notes section in the recipe below for other delicious yogurt toast flavor combinations! If you’re not a breakfast or morning person, then I encourage you to try this cinnamon toast recipe for lunch, an afternoon snack, or even dessert (I think I may have devoured this toast at all times of the day this past week…don’t judge ha!). And if you’re still skeptical of vegan yogurt on your toast…DON’T BE! Try it and make it a thing! I promise your kids will love you, your taste buds will love you, and most of all you’ll have an easy delicious recipe to whip out on any occasion. Serve this vegan toast for a fancy brunch or turn them into mini-toasts for appetizers! So what are you waiting for? 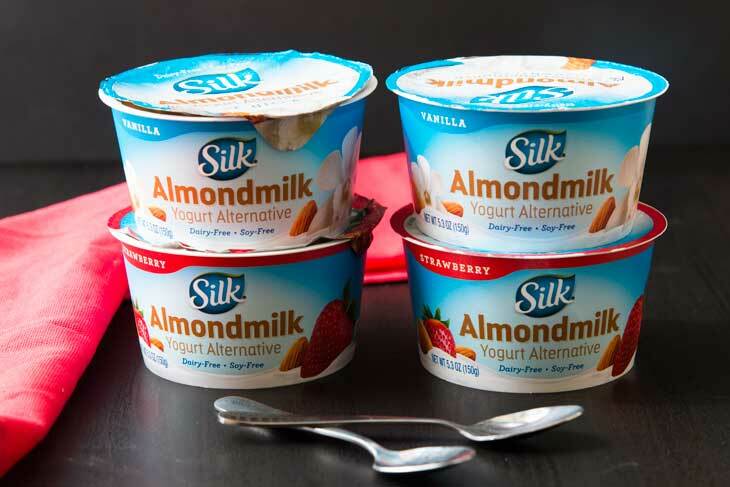 Grab a coupon from SILK, and use their store locator to find SILK almond milk dairy-free yogurt alternative near you. If you’re like me, you’ll grab their larger 24-oz tubs and use them throughout the week! If you like this recipe or post, be sure to leave a comment and use the rating field! You can also tag me on Instagram with any re-makes, @vegetariangastronomy #vegetariangastronomy so I don’t miss it, as I love sharing them on Re-Make Fridays! Or you can help me spread the word about my recipes on Pinterest and Facebook! Only 10-minutes! 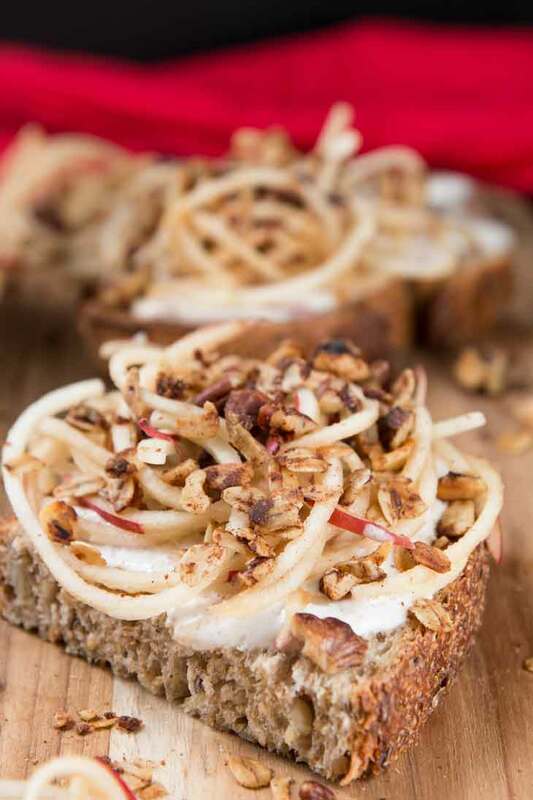 That’s all it takes to make this easy Vanilla Cinnamon Yogurt Toast topped with spiralized apples & home-made skillet granola! It’s quick and simple, vegan, can be made gluten-free, and the best way to indulge in the mornings. Heat a non-stick pan to medium-low heat. Add the remaining ingredients under skillet granola above to the heated pan and mix frequently until the coconut sugar melts. All the roasted oats & nuts should be coated in the oil, cinnamon, and sugar (this should take less than a minute). Turn off the heat and set aside. Place each slice of bread in the toaster oven and toast. Combine the non-dairy vanilla almondmilk yogurt with 1/2 teasp cinnamon. Spiralize the apple using a spiralizer, or thinly slice the apple. Mix in some freshly squeezed lemon juice to avoid browning. Cut each toasted slice of bread in half (if using large pieces). 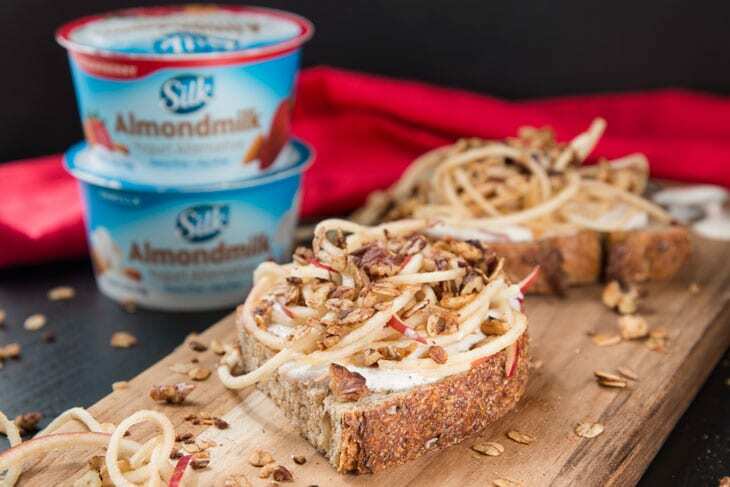 Spread a generous layer of prepared non-dairy vanilla-cinnamon almondmilk yogurt on each piece of toasted bread. Divide the spiralized apples evenly on top of the non-dairy yogurt layer. Top each toast with the prepared skillet granola. Enjoy! Bread - I prefer to use a freshly baked seedy multi-grain bread for this recipe, sliced. But you can use any type of bread. Gluten-Free - For the gluten-free option, use your favorite gluten-free bread. Make sure that the rolled oats are certified gluten-free. Make-Ahead Tips - You can spiralize the apple and make the skillet granola ahead of time and store in the fridge in an air-tight container. Be sure to add the freshly squeezed lemon juice to the apples to avoid browning. When you're ready to assemble, simply toast the bread and layer everything on. Nut Variations - Sub in other nuts such as almonds or hazelnuts for other combinations or sub in seeds. Other Combinations - If you're not a huge fan of vanilla-apple-cinnamon, use the recipe as a guideline and try these other yogurt toast combinations of non-dairy SILK almondmilk yogurt flavors/fruit. Thanks Jasmin! It's my first time experimenting with yogurt on toast as well and trust me it is now a staple! I am totally a yogurt and granola person haha so this recipe is totally up my alley. Love it! Thanks for this. Try them all together! So good! Thanks Reshana! Loving your take on yogurt and granola. So clever and it looks amazing. Thanks Rashmi! Yes...you can really do any yogurt and fruit combo...would taste awesome! I didn't even know Silk made yogurt. I'll have to look for some next time I'm at the store. They're my favorite milk company too. What a terrific recipe! YESSS!! They've been making non-dairy yogurt for awhile now...this is their almondmilk yogurt like that's also soy-free. Love SILK and all their products! Thanks so much! woah, interesting! i’ve never heard of yogurt toast. I bought some vegan plain yogurt at the farmers market. Can I use this and just add some vanilla to it? Yes you can, but you may need to add some sweetener to it as well. The SILK almondmilk vanilla yogurt is sweetened. But if you're fine unsweetened, then yes go for it! All these toppings are awesome! the only one that may not taste great unsweetened is the indian shrikhand since it's based on a sweet indian dessert :) Let me know if you try any of these!